Saturday is US Constitution Day! Didn’t you know that? It must be a big holiday, because my children are allowed to trade in their school uniforms for patriotic red, white, and blue garb tomorrow! So I’m going a little patriotic today, too. 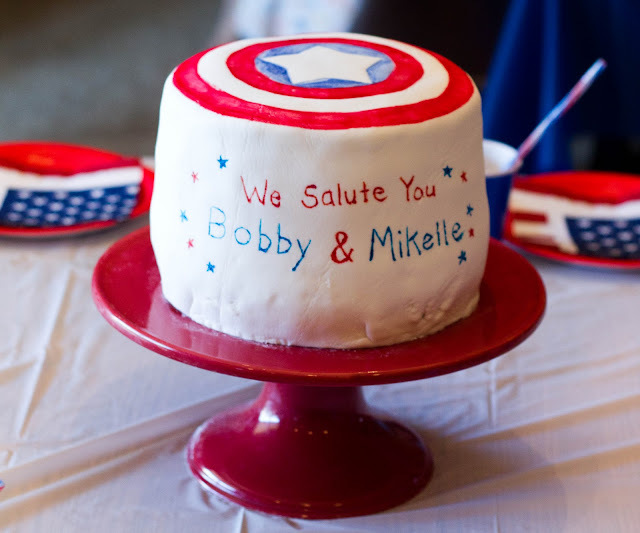 We hosted a combined birthday party at my house a while back for my husband’s sister and brother-in-law. Every time we do something like this, my in-laws tell me it doesn’t need to be a big deal hold their breath as they wait to see what crazy plan I will hatch. Since I think in themes and my brother-in-law is pretty much just an overgrown little boy, it is nearly impossible to not do something a little thematic and fun on occasions like this. I went a little x-men last year (this is for the man that owns his own yellow spandex Wolverine costume–yes, he does!). The simplest theme I could think of this time was Captain America–another Marvel comic book hero–who’s t-shirt he often sports. And since his wife (my SIL) doesn’t really care so much about themes, and had her birthday in July, I thought a little red white and blue would work well for her, too! 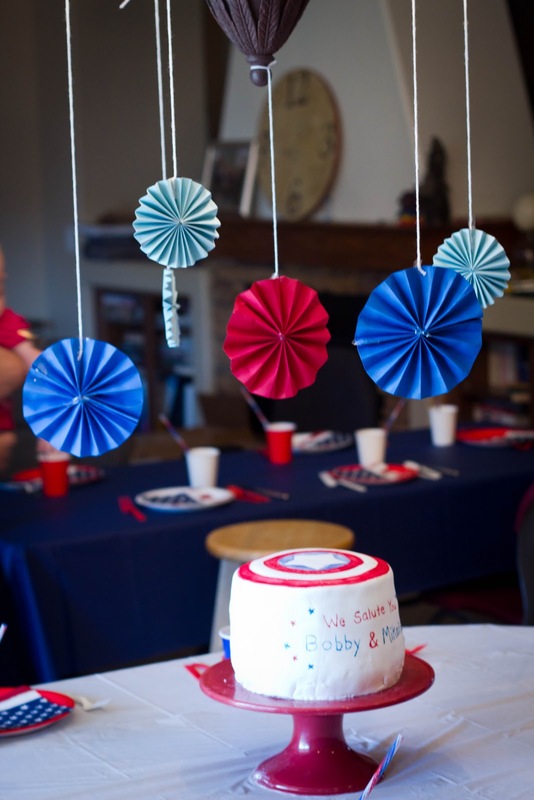 Besides, decorating just meant pulling back out some of the 4th of July decorations for an encore performance. My main focus for the party was the birthday cake. 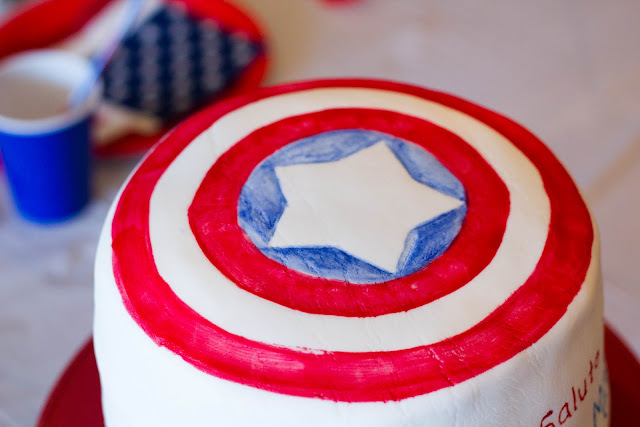 After Alec’s 1st birthday cake was such a hit, I thought I might go a similar route here. I’ve been using this White Almond Wedding cake recipe from Allrecipes. It works well for layer cakes because is makes them more dense and the sour cream keeps the cake very moist. The method I used actually worked really well and was pretty fast to do. I used some Petal Dust (like luster dust, but not shimmery) I had on hand, mixed it with an alcohol based liquid (like vanilla, lemon, or almond extract), and then painted it on with a clean paintbrush. I used different sized bowls and a star-shaped cookie cutter to make my design, and then just painted in the colors. I used food markers to write my message on the side of the cake. It’s Captain America on the inside, too!!! 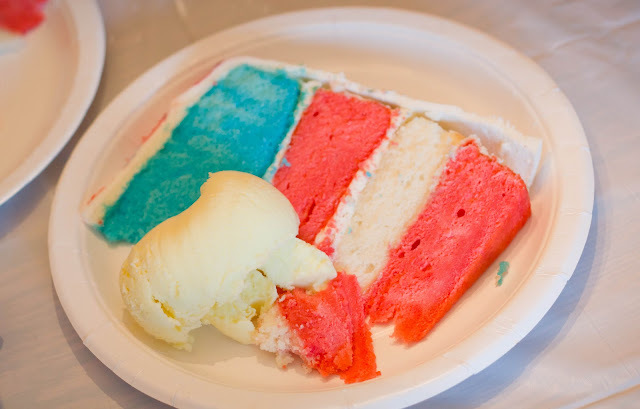 We had a special layered red-white-and-blue drink! This picture doesn’t show the blue so clearly, but I am excite to report that this idea I found on pinterest, really does work! For the complete how to, go to this post at Big Bear’s Wife. It made a pretty fun conversation piece, and didn’t taste half bad either! 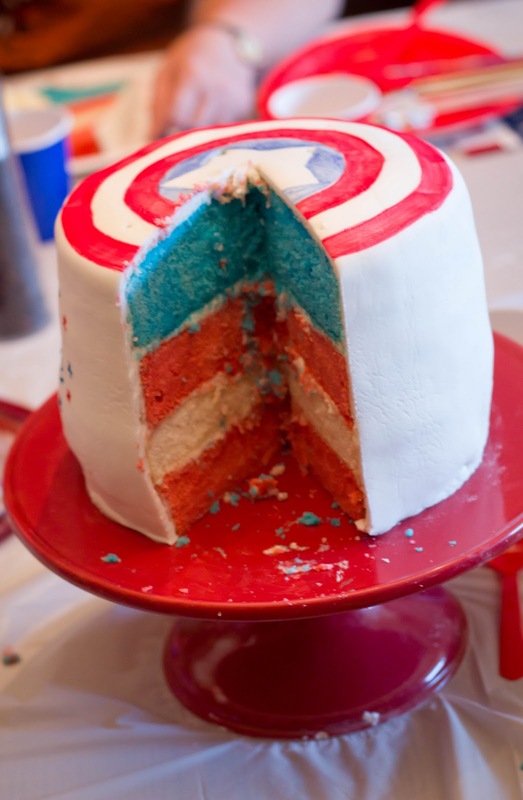 So what do you think of the colored layer cake craze? (And layered drinks for that matter). Of course you could use these ideas with other colors for most any occasion! What are you celebrating this weekend. Stick with me and I’ll get our special camping birthday blogged soon! 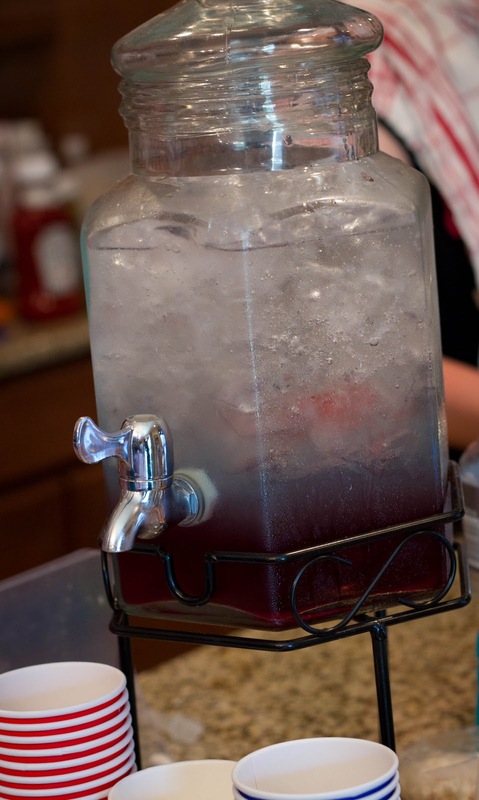 I've been wondering if the layered drink would work… I'm so glad you tried it and let us know it really does. Your party looks cute, and the colorful cake layers are the perfect surprise! Everyone needs a sister (or sister-in-law) like you! This cake is amazing!! My husband would love it if I made this for him! Filing away this idea for sure! 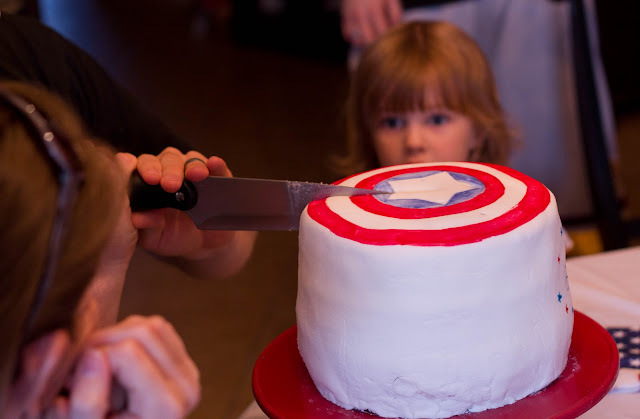 my 3 year old would go nuts for this cake!